I have a John Deere 650 compact tractor, diesel.It doesn't start. It turns over, but doesn't seem to be getting any fuel. It might be the fuel pump, but I don't know where to find the fuel pump since I have no manuals. It was running well, and I've only had it about 5 months. Any suggestions? Diesel engines and fuel systems don't function well during the winter months, unless special precautions have been taken to ensure trouble-free operation. I'm just guessing that your problem has to do with the fuel and the cold weather. I highly doubt that you have a bad injector pump. Can you tell me a little bit about the recent weather conditions in your area? A tiny bit of moisture in the fuel system can cause all kinds of these problems, especially when the temperatures fall below freezing. We had freezing weather and some snow for the a few weeks before it quit running. We drained the reservoir and cleaned the fuel filter and lines. It will turn over, but won't catch, and there's plenty of power. It seems like it just isn't getting fuel. 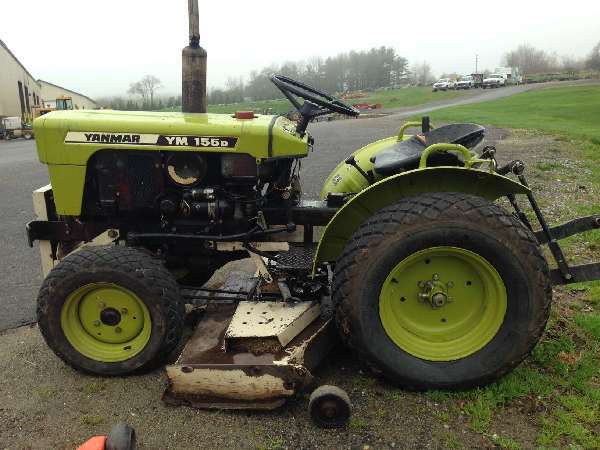 I had the equivalent of a JD850, but the engine layout should still be typical YanMar. Pretty sure what you're looking for is a little lump on the side of the engine, about half the size of your fist. There will be some metal tubing (fuel injector lines) up near the top of the engine. Follow them DOWN as far as they go - and you'll be at the fuel (injector) pump. But - first I think you should take a look at the sediment bowl. If there's a clear line with yellow on top and clear on the bottom, you've got water in your fuel. If it's empty, you're outa fuel. If it's full, unscrew the fuel filter and see if it's full. It's possible that you've lost your prime. I should probably rephrase that.....hehehe. First, let's make sure your fuel filter isn't plugged up with gelled fuel. When you drained your fuel tank, cleaned your lines, etc.....it's possible that your fuel injector pump lost its prime. Follow the instructions in your manual for re-priming the fuel pump. It usually starts by asking you to fill your fuel tank completely full. The extra height of the fuel in the fuel tank will assist in priming, with the aid of gravity. You should then open the priming screw on the fuel pump until you see fuel come out, without bubbles. When it begins to run clear, you can then close the prime vent screw again. You can keep the fuel from gelling (when it gets cold) by adding some diesel additive....such as that made by Power Service. If you don't have a priming screw, you should follow the directions in your manual. Every step is important. Follow the directions carefully. When a diesel fuel pump loses its prime, it can sometimes be a real bugger to get it primed again. I don't have a priming screw and I don't have a manual, but it sounds like this may be the problem. Can you tell me how to do it without a priming screw? If you've confirmed clean fuel in both the sediment bowl and the filter, loosen the hex collars at the top of the hard lines - where they physically attach to the fuel injectors. Put the tractor in neutral, and crank the starter until you see fuel flowing out the loosed hex couplers. Tighten couplers, engine should start. If no fuel arrives within a minute or two, suspect injection pump. This assumes no gelled fuel in the system. Let's get to the basics first! Does it have a electronic fuel selonid? Is it a manual fuel shut off? Is fuel flowing thru the shut off? 9 times outta 10 your fuel shutoff either electronic or manual is the problem. If its an electronic many times it gets some oil in back of the plunger. If it manual is it working or did a pin break or clamp slip? This might well be that 10th time Harvey. Your "electronic fuel selonid" is already considerably above "basics" for this tractor...The man said he's got a JD650; that's an 80s-vintage barebones two cylinder Yanmar thumper. Some say it's a YM1300 with green and yellow paint. The sound of my Yanmar duece made me realize where the term "Yamma-Hammer" came from. And if I'm not mistaken, there's no separate kill linkage. It's been several years since I sold mine. But I seem to recall just shoving the throttle lever all the way to the minimum stop is all it took to shut down the engine. Anything above minimum would ordinarily be enough throttle to start it with an otherwise working fuel system. Fuel Flow either Electronic or Manual should be the first step. I believe I injected a manual system into the comment because I'm not smart enough to know if fuel system has been altered. IS THE MANUAL THROTTLE LINKAGE WORKING CORRECTLY. DID THE CLAMP ON THE SHAFT LOOSEN? But what ta heck lets tear the fuel system apart first and drain and clean all the lines and get air in them before linkage or electronic is checked. THAT IS MY POINT!